My 9th graders complete a year-long travel project where they research and plan a trip to three European cities, embark on an in-depth study of travel writing, and then actually take their trip and travel write for themselves. It’s an incredible capstone project for their last year at our school, which currently ends at 9th grade. This year they’ve chosen to travel to Barcelona, Venice, and Florence. Last year’s group also chose Florence (along with Rome and Paris), so this will be my second time there. I’m tremendously grateful that this year’s group is taking me back, because I have a loose end to tie up: I have to climb Il Duomo. I’m extremely claustrophobic. And scared of heights. And scared of planes, spiders, boats . . . you get the idea. I’m afraid of everything. But particularly relevant to this story is the fact that I’m claustrophobic. I didn’t realize before our trip last year that there were so many climbable, tight spaces in Europe: bell towers, cathedral domes, castles. Modern buildings have wide passageways, thoughtfully constructed staircases, flippin’ elevators. But these buildings were built when architecture was first being worked out — when domes regularly collapsed, when being the architect of a building meant designing your own machines to haul stones to the tops of towers, when no one had ever tried what you were trying. The Florence Cathedral is one of these buildings. Il Duomo, as it’s called, has the largest masonry dome in the world. Its construction was planned and supervised by Filippo Brunelleschi, who convinced the guild in charge that he knew what he was doing in spite of the fact that no one had ever done anything like it before. Visitors can now climb up into his masterpiece using a series of twisting, claustrophobic passageways with extremely limited headspace and only pocket-sized window here and there. When my students and I arrived at Il Duomo last year, I’d just finished bravely talking myself up the dome of St. Peter’s Basilica in Rome, where at one point you are literally on a “staircase” so narrow that you have to turn sideways and hold onto a center rope instead of any kind of banister. A ROPE. So I was feeling like a superhero and also like I never wanted to see a dome again. But here we were in front of breathtaking Il Duomo. We were the first group there, so it was empty. It was a lovely day and all my students were being sweet and supportive. I mustered my courage and decided I’d give it a shot. I made it five steps. That was when I saw one of the pocket windows. A tiny tunnel, no wider than my hand, through over a foot of masonry. How much oxygen could that possibly allow into the passage? I vividly imagined myself suffocating and having a heart attack simultaneously, stuck up in the dome where no emergency crew could reach me. With that thought, I turned right back around, deciding to wait for my group on solid ground. No more than 15 minutes later I witnessed a woman exit the stairwell having a full-blown panic attack, which confirmed that I’d made the right decision. However, the inside of the cathedral was one of the most compelling things I’d ever seen. The wind rushed through like the sound of a waterfall or God’s voice. I stood below the dome, hundreds of feet below, wrapped in the sound and staring up at the centuries-old fresco of the Last Judgment. I felt my first tinge of regret. When I got home, I read Ross King’s book, Brunelleschi’s Dome, about Brunelleschi’s architectural accomplishment. I traced the sketches of herringbone brickwork with my fingers, wondering what they looked like in person, and my regret grew: would I ever get another chance to climb the dome? What if I missed out on a once-in-a-lifetime opportunity? I guess you’re starting to understand why I was so thrilled when my current students decided they wanted to see Florence. How often do you get a second chance like that? I have to climb that dome. Lying in bed the other night I tried to visualize myself navigating up the stairs and felt a familiar wave of panic start to rise. But I’m determined. I talked myself up the dome of St. Peter’s and I can do it again! Any advice for me? Anyone ever conquered a mighty fear and lived to tell the tale? Give me some tips! 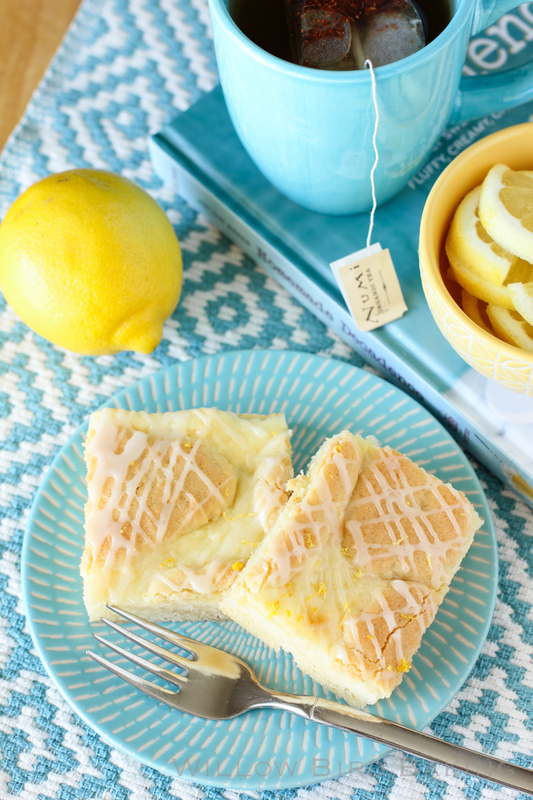 In return, I offer you Lemon Cheesecake Kuchen Bars: a super simple, sweet, bright recipe for my kindred spirits out there who love lemon! Enjoy an early taste of spring. 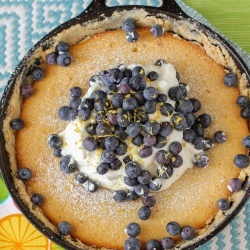 If you love lemon and simple desserts, here's a recipe just for you! These easy kuchen bars boast a gorgeous, bright lemon cheesecake filling. They're delicious warm out of the oven, but even better after chilling overnight. The dense lemon cheesecake straight from the fridge is out of this world. Preheat oven to 350 degrees. Prepare a 15x10x1-inch baking pan with a foil sling (overlapped pieces of foil that will be useful in pulling the bars out later). Lightly spray the foil with cooking spray. In a large bowl, beat the butter and shortening until combined. Add the sugar and cream the mixture until it is light and fluffy. Mix in the baking powder and salt. Beat in eggs and vanilla until just combined. Add in the flour in a few additions, mixing until just combined after each. Reserve 1 1/2 cups of the dough and press the rest into your prepared baking pan. Bake for 12 minutes. Make the filling: While the base bakes, cream the softened cream cheese in a medium bowl until fluffy before adding lemon zest, sugar, lemon juice, and the egg. Mix together until well combined. Bake an additional 25-30 minutes or until top is just barely starting to color (err towards 25 minutes: don't let it really brown or it'll be overdone). Cool in the pan on a wire rack for 10 minutes. Whisk together the glaze ingredients and drizzle the glaze over the bars before cutting and serving. But honestly, these bars are even better after chillin' overnight in the fridge -- nothing like cold, dense lemon cheesecake, oh my gosh. Julie!! The Wacker Family enjoys your blog! I often read your words out loud because they please me so. Ok…cognitive behavior therapy!! You’ve got enough time to get a few sessions in and you’ll be good to go! Lucky dog. Hi Rachel! I miss you guys!! This is a great idea! I’m going to give it a shot. It’ll be worth it when I’m looking out over Tuscany! These look delicious. I love lemon and these are perfect with a cup of tea. I’m obsessed with these bars. 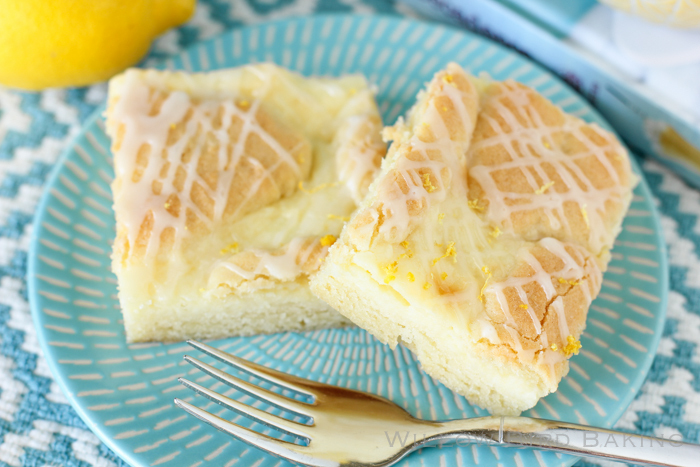 I love lemon pastries, so these are going on my baking list. PINNED!!! Julie, I have made lots of your recipes and love them! 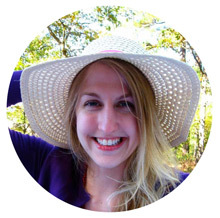 Your recipes are amazing and your blog is refreshing! The only other thing is that I live in Spain and love Barcelona! Can’t think of any high/claustrophobic places, except for the towers in La Sagrada Familia. I went with my art-teacher mother and navigated down those about 7 months pregnant and did fear for my baby’s life!! LOL! Very wind-y. But incredibly beautiful. Luckily, the Sagrada Familia has SO MUCH to appreciate on ground level that you won’t feel much regret skipping the towers! I love the idea of a year long “class” to teach kids how to plan an amazing trip. As a Girl Scout leader, I’ve taken them on trips before, but I did all the planning. I’d love to be able to do this with them, especially now that they are getting older. Any advice on how to help them do the planning? I wish I had some advice to offer you on getting over the fear…but I will say it is an incredible experience to climb the duomo! I’m jealous of your trip, it sounds amazing! These bars look so delicious – my husband loves lemon desserts so I will have to make this for him! Ah Julie! You really must do the climb. I did waaaaay back when I was a teenager (16)with my mother who was terrified of heights. She was very glad she did it, and even went up again on a later trip with my Joe (I hate to call him my step-dad and I love my Joe). That behavioral therapy is an excellent idea. I have suffered from panic attacks in the past (and once in a great while they pop back up). I had a therapist walk me through how to handle them and it was extremely helpful. I should actually say that after ‘mastering’ the talking myself through, I don’t have panic attacks so much as nervous attacks. I know that it’ll work just as well for you! It is a different kind of therapy I think, but with extremely sound priciples. You will not regret climbing up! I remember feeling nervous that people behind me would push me if I needed to stop, but everyone was rather lovely and there was none of that at all. Perhaps it is the church atmosphere. 🙂 I have faith in you and I know you can do it! 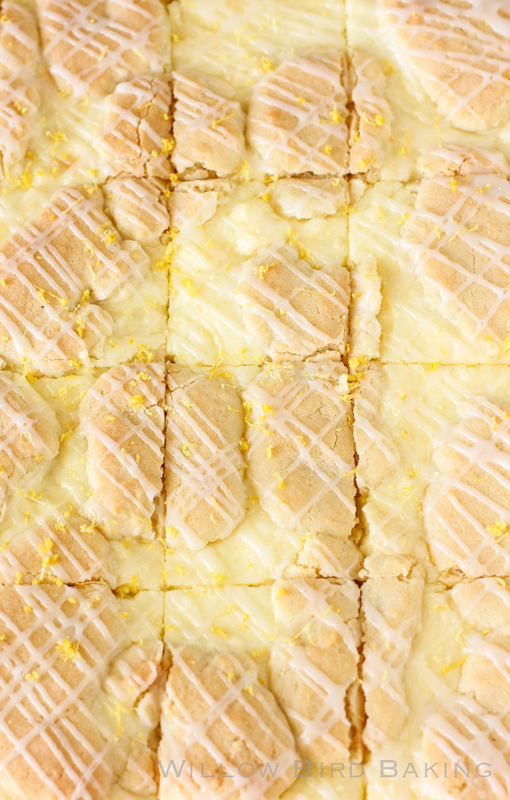 I need these lemon bars in my tummy now! A question – in the instructions you mentioned adding sugar and cream in the Kichen ingredients. In the ingredient list I don’t see any cream shown. Please adviae and thanks for this recipe which I will definitely bake! Hi Vickie, I’m sorry that the wording was confusing. It meant, “Add the sugar and cream the mixture until it’s combined” using “cream” as a verb. I’ve fixed it now to be clearer. Ohhhh! Got it, I should have figured that out! Thanks so much! I’m making this for an office party we’re having on Thursday. We just got another 2 feet of snow so an early taste of spring sounds perfect. Thank you. Pinning now! I love that your students get the chance to travel, what a great experience for them, and for you! These bars look amazing, I need to make them asap. Hello! Just in the process of making these now and noticed that the 1/4 melted butter you mention as being required for the filling is missed out in the instructions for step 3. I’ve included it as assume it is required (and the bars smell amazing!) but just wanted to let you know! Oops! That was a holdover when I thought I’d pour melted butter over the base before adding the cream cheese mixture, but then I ended up opting not to. I will delete it now. I think your bars will still be just amazing — please let me know how they turn out! Apologies for my mistake.